Team defense was key for the Boston Celtics in Game 1 vs the Philadelphia 76ers. The strategy focused on stopping playmaker Ben Simmons. With Game 2 looming tonight, May 3rd at 8:30 PM on TNT between the Boston Celtics and Philadelphia 76ers, I thought a short recap of what Brad Stevens and staff incorporated into the Philadelphia game plan on the defensive end for Game 1 would be helpful. Coming into this Eastern Conference Semifinal series, the 76ers were averaging 114.2 PPG in the playoffs as they defeated the Miami Heat in the first round series, 4-1. In Game 1 in Boston, the Celtics managed to hold Philly to 101 points – 13 below its playoff average. Currently, in the 2018 playoffs the 76ers are second in PPG, first in both free throws made and attempted, first in offensive rebounding, third in assists, and 4th in 3-pointers attempted. Boston switched a lot in Game 1 to keep bodies in front of Ben Simmons, who in the playoffs is averaging 18.2 PPG, 10 RPG, and 8.5 APG. The Rookie of the Year favorite, Simmons is not a perimeter threat to shoot the ball, so you can switch his ball screen to keep more size and length on him. By doing so, it also keeps the rest of the Celtics out of rotations, and doesn’t allow Simmons to pick the defense a part with his size, vision, passing ability, and decision making. 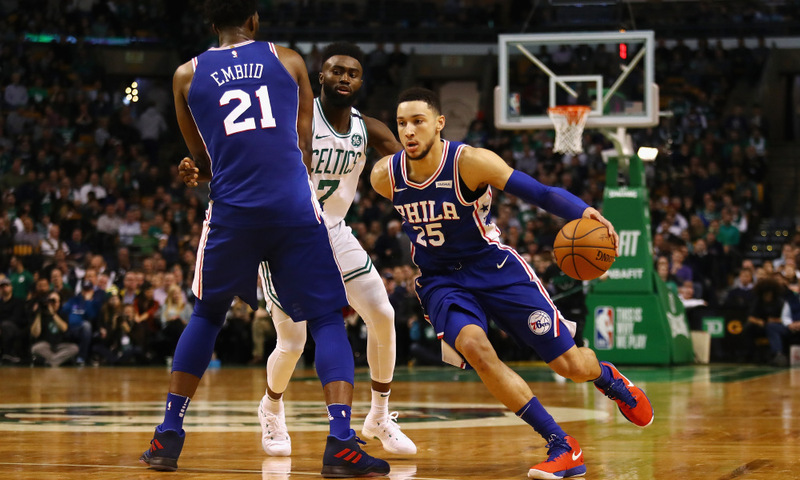 Being Philadelphia’s primary decision maker, and the orchestrator of its offense, Boston’s switching strategy forced Simmons to make plays off the dribble and draw defenders before scoring or kicking. This led to an unusually high seven turnovers in Game 1, while also being held to only six assists, below his average of 8.5 APG. Another advantage of switching the screen was that it put bigger bodies on Simmons, which kept him off the glass. He was held below his rebounding average in Game 1, collecting only 7 rebounds, all of them coming from the defensive end. He currently is averaging 2 ORB per game in the playoffs. The Celtics also decided on a full-team, 1-5 switching strategy on many Philadelphia offensive actions to prevent the 76ers from catching and shooting open 3-pointers – as they rank fourthth in the NBA Playoffs in attempted 3’s. That was the story of Game 1. Boston shot 17-35 (48.6%) from 3, while Philadelphia shot 5-26 (19.2%). Much of that had to do with the Celtics switching on Simmons and not allowing him to dictate who was taking the open shots. However, it also had to do with the entire team switching the off-ball screens as well. This switching defense cut down on the ball movement for the 76ers, and it showed in the game box score: Philly finished with 22 team assists, which is much lower then its playoff average of 26 APG. It’s evident in these clips that Boston is switching to take away the 3-point shot and forcing Sixers other than Simmons become playmakers. Flipping to the other side of the ball, here are a couple plays the Sixers were able to run successfully against the Celtic defense. Click on the diagram to download to FastDraw.